A manufacturing unit is one of the most critical places as far as security is concerned. 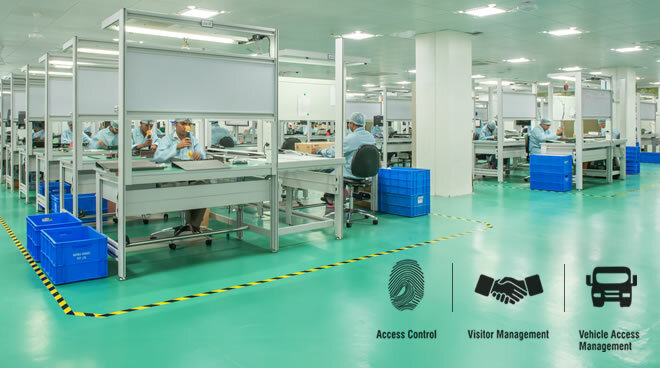 The premises of a manufacturing unit are generally larger in area, making it difficult to keep a record of the employees, visitors or vehicles that enter the premises. Up until now, every entry and exit of an employee, visitor or a vehicle was dependent on the presence or absence of a guard. This led to major security lapses and issues that became difficult to manage. Presented here are three simple, yet high end technological solutions for stepping up the security measures of a manufacturing unit. The first and foremost issue that you can address with the help of access control solutions is controlling the entry and exit of every employee. This will automatically eliminate unauthorized entry of a person or an employee. Furthermore, you can also implement controlled access of employees in sensitive areas of the unit. Access control solutions hence provide you with an opportunity to enhance productivity and eliminate erroneous and unauthorized access in the premises. Managing the in-flow of visitors is another big challenge experienced at the manufacturing units. Unguarded access may lead to unauthorised people entering the premises. With visitor management solution in place, you can control and keep checks on exactly who is visiting and with whom is the visitor meeting with. Such solutions also provide with authorised access cards or methods that make it easier to manage the visitors. Vehicles are another concern at a manufacturing unit. Numerous vehicles come in and go out of a unit and this often leads to erroneous recording or unauthorised entry within the premises. With vehicle access management solutions, you can easily control the movement of every vehicle coming and leaving the premises. This save the amount of man hour otherwise you have to invest behind such tasks along with securing the premises from unwanted and unauthorised entries.